According to the American Society of Anesthesiologists, a healthy 40-year-old woman underwent a revision mammoplasty under general anesthesia and the anesthesiologist noted there was a decline in skin temperature from 98.6 to 95 degrees during the end of her surgery, so a Bair Hugger blanket was placed on her. The Bair Hugger hose was placed under her blankets at the level of the ankle. Unfortunately, the hose was not connected to the blanket attachment device, and hot air, at around 104 degrees, was blown directly onto the patient’s legs. The patient complained of severe pain of her bilateral lower extremities and they found upon further examination, that she had third-degree burns to the region of her calves. Although she had plastic surgery and skin grafting, there was permanent scarring. A lawsuit against the anesthesiologst was settled for $250,000. Sadly, misuse of the Bair Hugger attachment hose is one of the more common reasons for pressure burns to patients after surgery. 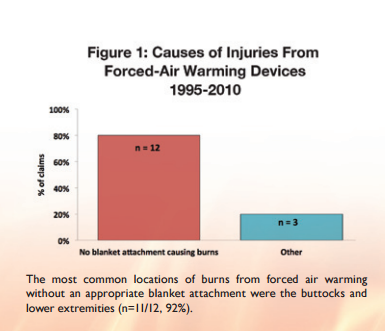 The most common locations of burns from forced air warming without a proper blanket attachment were the buttocks and lower extremities. Warming equipment is normally used in the operating room for warming the patient to prevent hypothermia after surgery. The most common cause of burn injuries from forced-air warming devices was use of the hose without the appropriate blanket attachment. Patients are continuing to suffer from burn injuries from the misuse of Bair Hugger devices. These types of injuries can be prevented by ensuring proper attachment of the Bair Hugger device. Burn injuries of this magnitude have been reported to the FDA, and in one particular case, the thermal injury progressed to a muscle necrosis so severe that an above-the-knee amputation was necessary. The Bair Hugger warming blanket can also lead to potential deep joint infection because of the forced-air being blown while the blanket is placed during and after surgery. A defendant who filed a lawsuit against the manufacturers of Bair Hugger claimed he developed a deep joint infection after a hip replacement surgery involving Bair Hugger Therapy. He needed 15 revision surgeries, including one surgery where his replacement was removed, and his leg is permanently damaged. 3M, the manufacturer of Bair Hugger, continue to market Bair Hugger warming systems as safe and effective in all surgeries. The company stands behind the claim that 170 studies have tested forced-air warming to be safe. The creator of Bair Hugger, Dr. Augustine, states that those studies are misleading and measure the wrong things. Whether the doctor’s claims are baseless or not, there is a serious adverse reaction to Bair Hugger warming blankets and something needs to be done regarding the potential of deep joint infection, and third-degree burns from misuse of the device. If you, or someone you love, have suffered from an injury due to the use of Bair Hugger warming blankets during or after surgery, contact Hood National Law Group.